allet Safety Support Bars are generally used with pallet racking. They are an affordable way to provide a safe foundation for stacking pallets into a pallet rack. With the support bars in place, the pallet does not need the strength to span the gap between the beams. The pallet will be at least partially supported by these horizontal bars, and they are an affordable alternative to wire decking. Used Pallet Support Bars for Pallet Racks can often be purchased independently to supplement an existing racking system or to piece together separate used racking components for your customized solution. Pallet Support Bars can have many different manufacturers, but if they are the right measurement and style then they will work with any pallet rack beams. 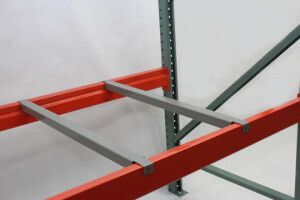 Shelf Master carries both wood and Steel bar pallet safety supports. Please call us for more information.